It’s easy to become comfortable with a club and not replace it. But that kind of thinking can be detrimental to your game, especially with wedges. “It’s not like your grooves go from being perfect, perfect, perfect and all of a sudden, they’re terrible. It’s gradual, and you might not notice it,” says Bob Vokey of Titleist. A study by Golf Datatech indicates golfers buy new wedges every four years. To find out what you’re giving up, we conducted our own test: we had a scratch player hit shots from multiple distances and turf conditions with a new wedge and a four-year-old wedge that had endured normal use, and we measured the results using a Foresight Sports’ GCQuad launch monitor. The new wedge produced 27.3 percent more spin than the old wedge on a 40-metre shot from the fairway. On a 16-metre shot from fairway, the improvement was 26.6 percent. The spin gain on a 40-metre shot from light rough was an impressive 64 percent. Anecdotally, the new wedge showed noticeably more grab, too. Investing in your short game is a wise play, and seeing the amount of improvement with fresh grooves should send those with older wedges to their nearest golf shop seeking replacements. COMMENTS (L) You can hit those bounce-bounce-check shots easily. (M) I like how the bounce lets this club set up flat behind the ball. (H) It has a sandpaper-like face that puts great action on the ball. VERDICT Cleveland’s response to the traditionally complex wedge market is to make a club that complements the irons most average golfers buy. The progressive head shapes – iron-like in the low lofts and wedge-like in the higher lofts – help these wedges fit in with the rest of your irons. That’s in addition to the lighter shaft, the perimeter weighting to help forgiveness and a wide, playable sole. For good measure, the CBX adds its top-shelf groove technology and micro-milled surface-roughness design. COMMENTS (L) Maybe the looks aren’t for you, but there’s nothing you can’t do well with it around the green. (M) The big sole can escape any sand situation. (H) You can chunk this and still get it on the green. VERDICT Feel is one of the must-haves in wedge design. But for Cleveland, “feel” isn’t some vague emotional paradigm. It’s science. Specifically, the centre of gravity aligns with the centre of the face, thanks to a weight-saving hosel design. This centres the head’s mass for more consistent feel. It also improves distance control, accuracy and spin. Much of that extra spin comes from a new groove design (narrower and deeper for better action from the rough) and surface-roughness treatments optimised by loft. COMMENTS (L) The shot I see in my mind is the shot I hit. Versatile, too. (M) The ball just comes off the face softly, with control. (H) The finish reduces glare. Head responds to all my little adjustments. 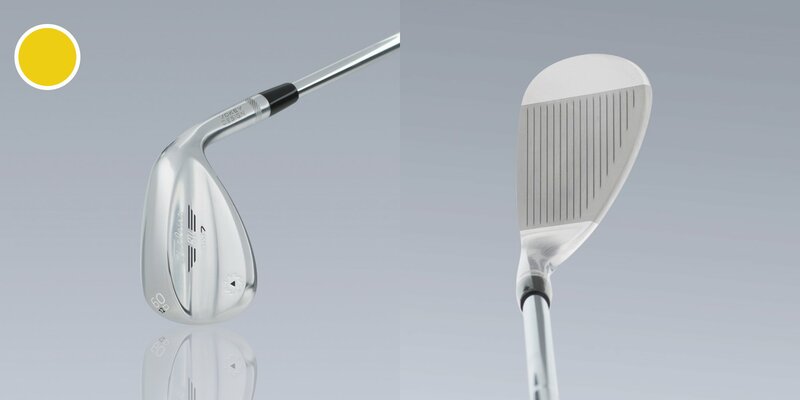 VERDICT Designing thin faces has been a focus of most golf clubs, but Cobra actually thickened the face on its wedges because it believes more material in the hitting area leads to better feel. The thickest area of the face is slightly higher than on previous Cobra wedges to improve beneficial vibration at impact. The thicker topline has a subtle chamfer to make it easy on the eyes. Wider, shallower grooves on the higher lofts provide more volume, and a variable milling pattern offers extra short-shot spin. COMMENTS (L) It didn’t cut through the sand as much as it “cushioned” through it. (M) Just big enough without being clunky. (H) Love the action. There’s a quieter sound but positive feedback. VERDICT Altering the head shape by loft isn’t an aesthetic exercise here. Rather, it was done to calibrate how each loft presents different performance requirements. As loft increases, more mass is placed towards the top of the blade. That raises the centre of gravity, which yields two things most players prefer in their higher-lofted wedges: flight control and increased spin. Other popular Mizuno features are here, too. That includes grooves and sole grinds that change with loft, and a forged carbon-steel design that uses boron for durability. COMMENTS (L) Nice, compact look. Terrific around the green. Easy out of the bunker. (M) Amazed how it consistently gets through the worst lies. (H) Nice contrast between the hitting area and grooves. VERDICT Mizuno’s ground-breaking use of boron-infused carbon steel in these forged wedges is something of a departure from how it has been used in the company’s irons. There, its strength was seen as a way to design thinner faces for increased distance. Here, its strength allows grooves, which vary based on loft, to be designed more precisely at the edges and with increased durability. The heads also change shape through the lofts: a straighter leading edge on the low lofts to work better with full shots, and a rounded shape on the higher lofts to help on open-face shots. COMMENTS (L) Great control and feel on full or touch shots. (M) More of a tour wedge. Narrow toe has a tonne of workability. (H) Dense sound. The ball ends up exactly where you expect it to be. VERDICT The idea that the R&A and USGA’s rollback on groove performance was a deterrent apparently never reached the engineers at Ping. They say the milled Glide 2.0 has “sharper groove edges than any previous Ping wedge.” The grooves (tailored to each loft) generate more spin than the original Glide wedges because of precisely milled edges that grab more of the ball. The four sole grinds range from narrow (preferred by short-game specialists) to wide (for deep divot-takers who require more forgiveness). COMMENTS (L) It’s a damage-control club: It can save a mediocre short game. (M) I could close it down or open it up, even with the wide sole. (H) Picks out the perfect amount of sand like the name suggests. VERDICT The latest upgrade to Ping’s Glide line is more than its darker finish – though it does provide increased durability for its grooves and four sole grinds. What catches your eye – and helps grab the ball on those short pitches and chips – is the half-groove cut tight to the leading edge in the higher lofts. The extra groove edges and volume yield better ball contact. Also important is the use of 8620 carbon steel for a softer feel, and a finish that repels moisture for more check on those dewy mornings. COMMENTS (L) Perfect turf interaction. There wasn’t any way it could get stuck. (M) It has a cushy feel on full shots. (H) I like the more square leading edge. Chipping was comfortable even on tight lies. VERDICT Grooves might be cool, but the business end of a wedge actually is the sole design and the leading edge. Those precise curves and angles greatly determine the subtle interaction of the club and your swing with the ground. Get it right and you make clean contact more likely, which leads to better spin. That’s why these wedges eschew handwork in favour of computer-guided milling to produce the final contours on its three sole shapes across 17 lofts, as well as the new high-toe version with two extra grooves. COMMENTS (L) Never played a wedge where off-centre-hits felt so good. (M) Anywhere you hit it, it gave you the same feel. (H) With all those scoring lines, there’s no place where you’re not getting spin. VERDICT The 23 stock options – the most for any model in golf – are meant to make every unique swing deliver the club more consistently through the turf. The result is more reliable distances and spin. Those options include the tour-proven D-Grind, now one of six sole grinds across a 16-degree loft range. The right grind makes it easier to reap other new features. Those include sharper cut grooves matched to specific lofts and new centre-of-gravity locations from low lofts to high for consistent distance and trajectory control. COMMENTS (L) The beefed-up top helps on those high-face shots from the rough. (M) Consistent flight, spin and turf interaction. (H) The right grind moved through the turf and spun better, too. VERDICT Despite offering just six lofts and one sole grind, this wedge family checks the important boxes of feel and spin. The forged carbon-steel construction and centred weight pad make centre strikes feel sweeter. As for spin, sure, the grooves have been optimised to R&A and USGA limits, but what’s improved from past Bridgestone designs are the flat areas between the grooves. Rather than milled with randomised swirls or etched-in lines, a distinct pattern of four mini-grooves adds extra friction. COMMENTS (L) The teardrop shape lets me hit every shot I wanted. (M) Easy to open it up for high shots, or close it for a runner. (H) The way the heel meets the head makes it smooth through the sand. VERDICT Epon might not be on your radar, but its parent company, Japan-based Endo, is well known within the golf industry for making many of the top brands’ forged clubheads. These compact wedges illustrate that expertise quietly (blink and you’ll miss its logo on the back). With the hosel and clubhead forged from a single piece of soft carbon steel to enhance feel, this design incorporates three sole grinds based on loft. Oh, and those distinctive grooves? An extra layer of milling improves spin in wet conditions. COMMENTS (M) The shorter shaft and head weight made it easy to get the clubhead to the ball. (L) Not as forgiving but still versatile. Good bite. (H) A good player’s wedge. The feel is solid. VERDICT When Wilson changed its groove design, the differences were in the tens of thousandths of an inch. In practical terms the groove is now more square-like. It’s legal, and like many in the wedge game, its sharper edges and steeper sides push spin rates closer to what they once were. The edges mean better grab, and the steeper sides channel debris for cleaner contact from the rough. The 11 laser-etched lines between each groove give partial shots more spin, and the raw finish of the 8620 carbon-steel head yields a softer feel. COMMENTS (H) The feel of the ball on the face feels like a forged club. (M) Nice heft so you feel the club throughout your swing. (L) With the raw finish, there’s no glare, and it felt softer.